Young Alfred Hitchcock movie? Betty Compson in The White Shadow, which was actually directed by Graham Cutts. Among other duties, Hitchcock wrote and edited the 1923 film. About thirty minutes from the long thought-lost The White Shadow / White Shadows (1923), believed to be the earliest surviving feature with an Alfred Hitchcock credit, has been unearthed at the New Zealand Film Archive. Directed by Graham Cutts, and starring Betty Compson and Clive Brook, The White Shadow was found among a number of unidentified American nitrate prints safeguarded for more than two decades at the archive. Based on Michael Morton's novel Children of Chance, The White Shadow was written and edited by Hitchcock, who also served as assistant director and production designer. The future director of Blackmail, The Lady Vanishes, Rebecca, Lifeboat, Strangers on a Train, Rear Window, North by Northwest, Psycho, and The Birds, was 24 years old at the time. Made in Britain, the “wild, atmospheric melodrama” stars Betty Compson as twin sisters, “one angelic and the other 'without a soul. '” The White Shadow was released in the United States (as White Shadows) by Lewis J. Selznick, father of Gone with the Wind producer David O. Selznick, who would bring Hitchcock to Hollywood in 1939. According to the New Zealand Film Archive's website, the surviving reels of The White Shadow will be preserved at Park Road Post Production in Wellington. The site adds that “black and white duplicate negatives will be struck from the original nitrate material and color prints made which will replicate the tints used in the original print.” It was also at Park Road that John Ford's long-thought lost 1927 silent Upstream was restored. 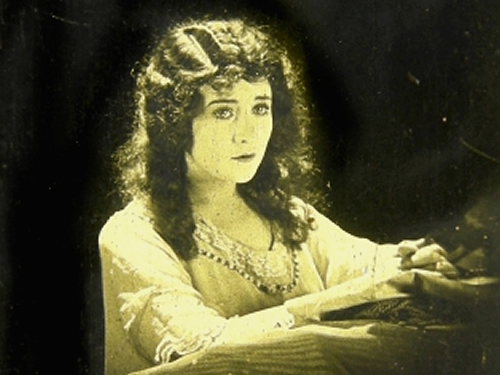 Among other titles recently identified for preservation are Muriel Ostriche and Alice Guy's early Technicolor short The Love Charm (1928), a 1920 dance demonstration by ballerina-choreographer Albertina Rasch, and a fragment from the Keystone Kops' slapstick comedy In the Clutches of the Gang (1914). Those films will be preserved over the next three years in partnership with the US National Film Preservation Foundation (NFPF), the Academy of Motion Picture Arts and Sciences, George Eastman House, the Library of Congress, the Museum of Modern Art and UCLA Film & Television Archive. They'll eventually be made available in the United States, and some of those will be viewable on the NFPF website. An additional print of The White Shadow will be presented to the British Film Institute in honor of its Hitchcock rescue project. The New Zealand Film Archive houses more than 150,000 titles, from features to documentaries, short films, home movies, newsreels, TV programs and advertisements. Photo: New Zealand Film Archive. Jan. 3 update: Despite some confusion in various reports, the 1923 melodrama The White Shadow, half of which was recently found at the New Zealand Film Archive, is not Alfred Hitchcock's directorial debut. It isn't Hitchcock's first ever credited effort, either. That honor apparently belongs to Woman to Woman, which came out earlier that same year. Woman to Woman, which actually premiered in New York thanks to U.S. distributor Lewis J. Selznick, remains lost. In fact, it's one of the British Film Institute's 75 Most Wanted Films. Hitchcock worked as assistant director and – without screen credit – did the art direction and co-wrote the screenplay adaptation with director Cutts. Alma Reville, Hitchcock's future wife, edited the film. Clive Brook, one of the top British film stars of the '20s, would star in Frank Lloyd's 1932-33 Best Picture Oscar winner Cavalcade. His last film appearance was in John Huston's The List of Adrian Messenger. Both Brook and Compson died in 1974. Graham Cutts continued making movies until 1940. By then, most of his productions were B fare. His best-known effort is the silent crime drama The Rat (1926), starring Hollywood's Mae Marsh (The Birth of a Nation, Intolerance) and stage star Ivor Novello. Cutts died in 1958. Alfred Hitchcock's “official” first feature film as a director was the 1925 melodrama The Pleasure Garden, starring two other Hollywood imports, Virginia Valli and Carmelita Geraghty. Hitchcock would be nominated for five Oscars: Rebecca (1940), Lifeboat (1944), Spellbound (1945), Rear Window (1954), and Psycho (1960). He was given the Irving G. Thalberg Memorial Award in 1968. He died in 1980.